Computer Assist employs data protection at several layers. 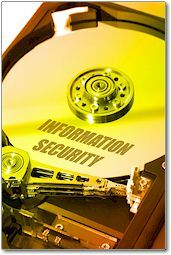 Sensitive information is tightly restricted only to authorized users via access restrictions, data encryption, and physical security. Any time you visit a web site that asks you for sensitive information, you expect to communicate that information over an encrypted connection using SSL. Computer Assist takes that a step further by encrypting data as it is stored in the database. Even authorized personnel who have access to your server cannot access data that has been encrypted. Physical security protects you from unauthorized users being able to physically access the servers holding your information. A state-of-the-art data center protects your systems with carded access and digital video monitoring. Application security protects access to sensitive data, system settings, or any other protected data through tried and tested methods for protecting application access. Only authorized users are able to access your site, and then they are tightly restricted to accessing only that information they are authorized to view. Our applications are aware of, and protect you from, the common and not-so-common attacks that attempt to gain unauthorized access. Information Privacy means that visitors to your site expect to be able to provide you with personal or sensitive information, confident that that information will be kept private. Information Security means that your solutions are protected from a variety of threats such as theft, denial of service, viruses, and more.